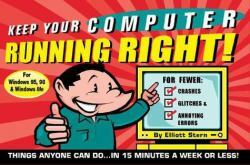 Keep Your Computer Running Right is a proven program of preventative maintenance and performance tune-ups. Even better, these are simple, easy-to-perform operations that anyone can learn to do -- in as little as five minutes a week.Quite simply, here's the best under-$10 computer investment you'll ever make. You'll learn 13 Performance tune-ups. Everyone knows about Defrag and Scan Disk, but did you know your computer needs a nap now and then to run at peak performance? Follow these simple performance tips and go from sluggish to lightning fast within 15 minutes of using this book! The volume also contains: -- 11 Rules for Proper Operation-- 10 Top Tricks for Smoother Sailing-- 10 Preventative Maintenance MeasuresDivided into three experience levels (Beginner, Intermediate and Advanced), here's a book for anyone, at any level. Better yet, Keep Your Computer Running Right! is a book with a sense of purpose and a sense of humor. There's also an easy-to-follow checklist for: What to Do Weekly, What to Do Monthly, and What to Never Ever Do to Your Computer!Fifteen minutes after first using this book to fine-tune your computer, you'll say, "Wow, what a difference! ".